HTC announced Nexus 9 and the mobile is not what the consumers expected it to be. High compromise was made when it came to design & speakers. Being led down with these two core components missing Nexus 9 was still being purchased for other amenities that made it worth the money. HTC Nexus 9 also supports 4G and NFC to keep you connected with anyone across the globe. There are also cons to Nexus 9 and the big one is the lack of a micro SD card, for additional storage you would have to transfer all your data to a laptop/desktop. Nexus 9 has an IPS LCD Screen, touch off course and the size is 8.9 inches, 2GB worth of RAM and 32 GB memory to keep you loaded with your personal data at all times. Rear camera is 8MP and the front camera is 1.6 MP which was expected to be much more. A quad core Nividia Tegra K1 CPU which also has Ge-force GPU to give those amazing high definition results of camera and movies. 8MP rear camera gives you amazing results and the pictures are worth a thousand words. Android Kit Kat version 4.4.4 graces Nexus 9 and works in complete harmony with the quad core to give you seamless connectivity to the world. 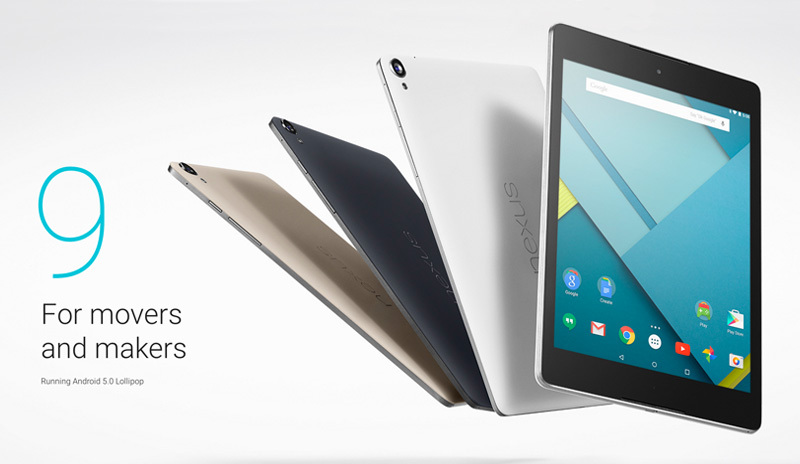 HTC Nexus 9 is available in Indigo Black and Lunar White. Now these are the specification which we discussed let’s look a little deep in what the phone is all about. The Quad core processor is nothing short of a high run tech gadget that works and does not hang up easily. It is loaded to carry on simultaneous apps which in turn give you the ability to multitask at any time. That seamless running is not possible without a 2048 MB RAM which works with KitKat 4.4.4 and gives the user a smooth transition through apps and screens any minute of the day. The battery cannot be replaced by the user, hence if a battery issue you would have to consult the company itself. Even though Nexus 9 is coming up with these issues the phone is still pretty much in comparison with others selling high. HTC has created a name for itself and the name is keeping its reputation up.